I didn’t keep track of how many build hours the Medium Tool Chest took, but I can’t imagine it was more than 75 (not including travel time to and from my thickness planer). 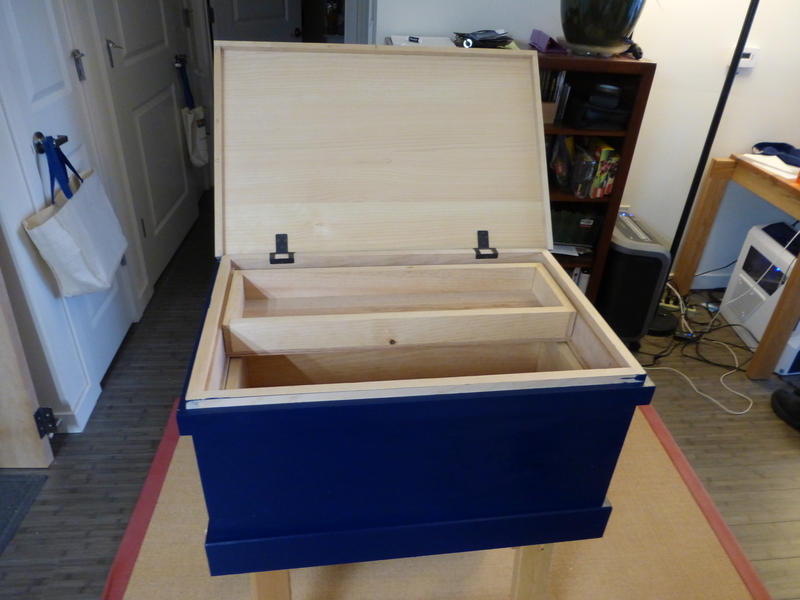 I enjoyed the making, but as you all probably know, I won’t be using the chest for my woodworking shop. It’s just not the right size for my set of tools. I ordered one more hinge for the top. I think, though, I’ve caught the tool chest bug (slightly more manageable than the workbench bug?). So my next tool chest will be a custom size more like to the Anarchist’s Tool Chest than the current one. 1.) Cut Nails are awesome. They hold well and look great. I think my previous aversion to metal fasteners was mostly because I’d never used real nails before. I still dislike screws, though. Even flathead. 2.) Hand-cut Rabbets are fun. The tool trays are both rabbeted/glued together (because I’d had enough of dovetailing by the end). I didn’t own a fillister plane at that point, so I ended up splitting the rabbets (just like you’d split a tenon) and then fine tuning to depth with a router plane. End result: parallel, uniform rabbets all around. 3.) Never skimp on flattening. I thought the oak bottom for the lower tool tray would pull the tray carcass into wind, but I was wrong. 7/16″ oak just isn’t rigid enough to straighten out 11/16″ pine. I should have flattened and/or thinned the tray carcass boards before joining. As a result, the lower tray rocked, even when full of heavy tools, which took some flattening. 4.) Measure twice – cut once. The upper runners for the tool trays are 1/4″ shorter than they should be. Because and only because I set my combination square wrong and didn’t check it again before ripping them down. Sometimes we all need a reminder of the oldest woodworking adage. 5.) I really do need a larger workbench. The Milkman’s Workbench is great, but I made the transitional slab (with Veritas planing stop) to handle the longer stock in a (sort of) vice-less approach. It’s worked well so far, in conjunction with a DIY moxon vise. Like I always say: now what? I think you answered your own question: build a chest that IS the right size for your tools.